Fluffy, airy, and sweet Buttermilk Pancakes are a must-have on Saturday mornings! Maple syrup and fresh fruit are always welcome, too. We make pancakes weekly in our house. Most of the time, I substitute half of the all-purpose flour with spelt or whole wheat pastry flour and top our pancakes with fruit, but sometimes it’s nice to go with a classic like Buttermilk Pancakes. For this recipe, I wanted to make fluffy, light, and airy buttermilk pancakes with crisp edges, and a slightly sweet, buttery flavor. Forty pancakes later, I was happy with my results: I finally figured out how to avoid the common pitfalls of dense, chewy, eggy, or rubbery pancakes. It imparts a subtle tangy note in baked goods like these pancakes. It provides the acidity needed to react with the baking soda in the pancake batter. This reaction creates carbon dioxide gas, which helps the pancakes rise and gives them a tender crumb. Without the acidity from the buttermilk, your baking soda also can’t perform another key function: to speed up the caramelization sugar, which gives you a darker, caramelized color on the outsides of quick-cooking baked goods like pancakes. While plain milk does have some acid in it, it’s not enough to get the response you need from baking soda. Most baking powder is double acting which means it responds to both liquid and heat. The two-stage process provides most of the leavening in your pancake. Buttermilk provides the liquid needed for the baking powder to dissolve and create the carbon dioxide gas, which contributes to the light airy texture of a pancake. What to do if you’re out of buttermilk? Thin some yogurt or sour cream with a little milk until it’s the same consistency as buttermilk. This will work just as well as buttermilk in your pancakes. In a pinch, you can also add lemon juice to milk, though it won’t be quite the same. Pancake recipes often call for whisking together the dry ingredients, but I prefer to sift them through a strainer or sifter. I live in an area that can be humid in the summer, which can cause leavening agents like baking powder and baking soda to clump. If you’ve ever had a slight metallic or bitter flavor in something you’ve baked, it could be from a small clump of baking powder or soda. Sifting eliminates that problem in a way that whisking won’t. Flour has gluten in it. Gluten helps provide structure to breads and cakes. Stirring batter or kneading dough helps to develop gluten — which you want with pasta, and sturdy breads, but not for quick breads, muffins and pancakes. With these delicate baked goods, too much mixing can make them tough, chewy or rubbery. When adding dry ingredients to wet ingredients in pancakes (and other quick breads), it’s best to stir just until incorporated and not a second more. If you’re adding fruit or chocolate chips to the batter, add them when your batter still has a few dry pockets of flour. Here’s another tip to help avoid over-mixing: use a whisk or fork to thoroughly beat the egg. This makes it easier to incorporate with the dry ingredients, so you don’t have to mix as much. I use a 10-inch square nonstick flat griddle with 1/2-inch sides for making pancakes, like this one, but any large skillet with low sides will work. You want to be able to easily get a spatula under the pancakes to flip them, and the lower the sides, the better. MAKE SURE YOUR SKILLET IS HOT! Make sure the skillet is hot enough that your butter is foaming and sizzling before you add the pancake batter. 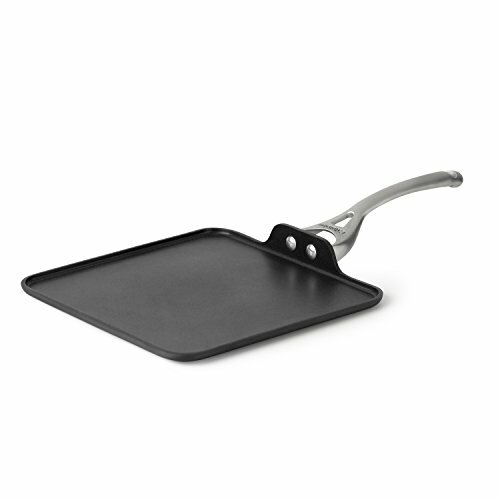 This makes sure that your pancakes start to cook as soon as they hit the pan. If you add the batter too soon, the pancakes will spread too much and won’t be quite as thick and fluffy. I prefer to fold most fruits and chocolate chips into the batter itself, rather than dotting the pancake with fruit after the pancake has been scooped onto the pan. This way, the batter coats the fruit or chocolate and encloses them in a little pancake bubble, which makes them less likely to burn when they are flipped. Sliced bananas are best added to the top of the pancake after the batter has been scooped onto the skillet. When you flip the pancake, the bananas will caramelize in the butter and taste even better. When feeding families, everyone usually wants something different, so dotting fruit or chocolate on the top makes breakfast easier to customize. To freeze, let the cooked pancakes cool to room temperature, then layer them between sheets of parchment paper and seal in a gallon-sized zip-top bag. The parchment will prevent them from sticking together once frozen, allowing you to remove just one or two as needed. To reheat, spread a few frozen pancakes on a plate in a single layer (it’s ok if they overlap a little) and zap in the microwave for about 30 to 45 seconds, then pop them in the toaster. The microwave thaws them, and then the toaster to finishes the job and also provides the crisp fresh-off-the-griddle edges. Out of butter? You can fry pancakes in oil and replace the butter in the recipe with oil if you prefer, just make sure it’s a neutral flavored oil like canola. Want to cut the butter and sugar entirely? You can eliminate both the sugar and the butter from this recipe and still make pancakes. The flavor won’t be as rich or sweet, the color as golden, or the texture as light, but it will still be a pancake! MORE GREAT PANCAKE RECIPES TO TRY! Watch the video on how to make buttermilk pancakes! Enjoy these fluffy buttermilk pancakes on their own, mix in fresh berries or chocolate chips, or top with sliced bananas for a delectable weekend breakfast treat. 1 Sift together the dry ingredients: In a medium bowl sift together flour, sugar, baking powder, baking soda, and salt. Make sure there are no clumps. 2 Whisk together the wet ingredients: In a small bowl, whisk egg until the yolk and the white are combined. Add buttermilk, melted butter, and extract. Whisk until combined. 3 Make the pancake batter: Add the wet ingredients to dry ingredients and gently stir until just combined. If adding berries or chocolate, add them when the batter is not quite fully mixed. Continue mixing just until combined. Don’t over mix, or your pancakes will be rubbery not light and fluffy. 4 Heat the skillet: Set a large, flat-bottomed non-stick or well-seasoned cast iron skillet over medium heat. Add butter. Once the butter has melted and sizzles on the pan, scoop a rounded 1/4 cup of batter onto the pan. Add additional scoops to cook more pancakes, spaced a few inches apart. Cook until you see bubbles forming in the center of the pancake and the edges look slightly drier than the middle, about 3 minutes. Flip and cook for about 2 minutes on the other side. The cakes should be lightly golden on both sides with crispy edges. 5 Serve: Serve with maple syrup or powdered sugar and fruit. If feeding a crowd keep warm on a plate in a low oven until ready to serve. To freeze and reheat: Let the pancakes cool to room temperature, then layer between sheets of parchment paper and seal in a gallon-sized, zip-top bag. To reheat, spread a few frozen pancakes on a plate in a single layer (it's ok if they overlap a little) and zap in the microwave for about 30 to 45 seconds, then pop them in the toaster. The microwave thaws them, and then the toaster to finishes the job and also provides the crisp fresh-off-the-griddle edges. Hello! All photos and content are copyright protected. Please do not use our photos without prior written permission. If you wish to republish this recipe, please rewrite the recipe in your own unique words and link back to How to Make Fluffy Buttermilk Pancakes on Simply Recipes. Thank you! Love the pancakes. I use cardamom in the pancake mix, instead of vanilla. Hi, Helle! Ohhh, cardamom sounds delicious! Great idea! Thanks for letting us know you liked the pancakes and for sharing your flavor variation! OH WOW! I’m not a ‘chef’ so your GREAT explanation of how and what the ingredients do and react together finally made sense to me….Thanks! Hi, Henry! I’m happy to hear the detailed instructions were helpful. Happy New Year! These were yummy! I happened to have buttermilk on hand and was able to make these this morning! Delicious!! Hi, Tess! I’m so glad you liked them! Thanks for letting us know! This recipe is crazy good. I’ve made it at least twice. My kids love it. They really ARE fluffy! Hi, Carrie! I’m so glad your kids love the pancakes! Thanks for letting us know! Thank you Summer …will give it a try ! Wow! I’ve never heard of corn in pancakes, but I bet it is delicious! Thanks for sharing, Jeff! I’m going to give it a try! Sounds really good. But you’ll get even fluffier pancakes is you separate the egg, add the yolk when adding wet to dry. Whip the egg whites and fold in after all ingredients are mixed together. I do the same thing with my waffles and cornbread. Hi, Hikerwife! Great tip! Thanks for sharing. Ms. Hikerwife, You beat me to it by a day. I’ve always separated the eggs and whipped the whites before gently folding them into the other wet ingredients. I agree with all else. And Jeff, I’m in Philly (home of scrapple – every part of the pig except the squeal) and my grandmother often made pancakes with corn, although she called them corn fritters. Happy memories, for sure.